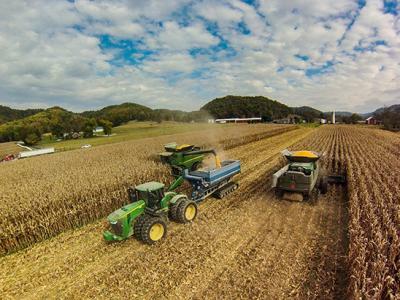 Researchers at the University of Kentucky College of Agriculture, Food and Environment are beginning on-farm studies to look at which best management practices work best for Kentucky grain farms, and they need producers’ help. In the project, called Blue Water Farms, UK researchers Brad Lee, Dwayne Edwards and Erin Haramoto, along with Glynn Beck with the Kentucky Geological Survey, will study which U.S. Department of Agriculture, Natural Resources Conservation Services’ best management practices help farmers retain the most soil and nutrients on their farms. This will help the NRCS fine tune its recommendations for Kentucky producers. UK researchers will specifically compare whether direct injection of poultry litter or broadcast litter applications keep more nutrients and soil on farms. They will conduct this study on tile-drained land in a no-till, corn-soybean rotation in Daviess and surrounding counties. They also plan to compare the ability of cover crops to keep soil and nutrients on the farm in Caldwell and its surrounding counties. Participating farms in this study need to be in a no-till, corn-soybean rotation. UK researchers will monitor the effects of these best management practices on participating farms for around 10 years. Interested farmers can contact their local Cooperative Extension Service or Lee at brad.lee@uky.edu. The Kentucky Soybean Board is partially funding the project.